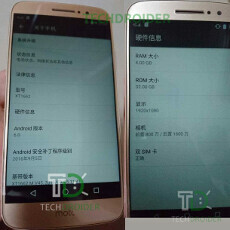 Late last month, a device known as the Lenovo Moto M (XT-1662) passed through China's TENAA certification process. Along with the official shots, we caught a few details of the handset's specs, including a 5.5-inch, 1080 x 1920 display, 2.1 GHz MediaTek MT6755 SoC and 3 GB RAM. Now, we have a couple of legit-looking snaps of the yet-to-be-showcased phablet. It's fair to say that Lenovo and its Motorola subsidiary have been rather busy of late. The company took the wraps off the Moto Z and Moto Z Force in June, then delivered the Moto Z Play and Hasselblad True Zoom camera during the early stages of IFA. Berlin's big tech gathering also spawned the A Plus and (Vibe) P2, as well as the K6, K6 Power and K6 Note. Alas, the Chinese firm is not quite finished there. The depicted Lenovo Moto M (XT-1662) doesn't deviate too far from the archetypal Moto design language. Though it does look cheaper than the new Moto Z trio, it's still a stylish mid-range handset that looks destined for the Chinese market. Said to be crafted from aluminum, it'll apparently include a rear fingerprint sensor, and there doesn't appear to be a physical home button. As we previously learned, the device will include a 16-megapixel rear camera along with a 5-megapixel selfie snapper, 32 GB of storage and a 3000 mAh battery. The eventual launch of the XT-1662 may be accompanied by the Lenovo Moto M (XT-1663), a smaller handset said to include a 4.6-inch display and MediaTek's MT6750 processor. Alas!.......... Why the hell do you use such a word? What botheres you so much? After all its a tech site .You cannot call a phone launch with Alas! Alas! 4.6 inch is quite frustrating.